Treasured Grace opens in 1847 as sisters Grace, Hope and Mercy make their way along the Oregan Trail. After losing their mother, their only family is an uncle living in Oregon City and she is desperate to reach him. Grace marries the Right Reverend T.S. Martindale in order to join a wagon westbound wagon train. When the Right Reverend passes away on the trail, Grace agrees to winter at Whitman Mission. During their time there, the trio meet many colorful characters including Alex Armistead and a tribe of Cayuse Indians. Grace feels an immediate attraction to the surly trapper and despite a reluctance to admit it, Alex feels the same. But tensions are growing between the white missionaries and their Native neighbors. When the Cayuse blame a measles epidemic on the mission’s founder trouble is inevitable. Treasured Grace is a great historical novel set around an actual historical event. Peterson’s research is evident as she paints the culture of the Native Americans, even contrasting the Cayuse to their Nez Perce cousins. The book is transparent in its evangelical theme and I loved the number of Bible verses woven into the text. Grace is a healer and while her advocacy for pure water was obvious to me, I never understood why she always took vinegar or what other herbs she used in her many tonics. I must confess that it felt somewhat disjointed in the first couple of chapters as we met Alex and his trapper friends completely separately from the main characters and there were a number of members of the wagon train introduced. I didn’t feel like I had a good grip on who’s who until nearly the middle of the book. However, by the climax of the story I felt I knew the important characters well enough to follow the story line. 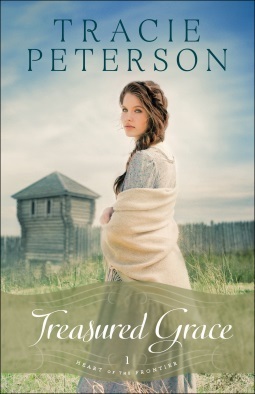 Bethany House Publishers supplied a copy of Treasured Grace in exchange for a fair review.